EnviroInsite needs to know the ground surface elevation for a variety of application options. By default, the program uses the measured ground surface elevation at wells or boreholes. Sometimes this is not good enough or there are not enough wells. 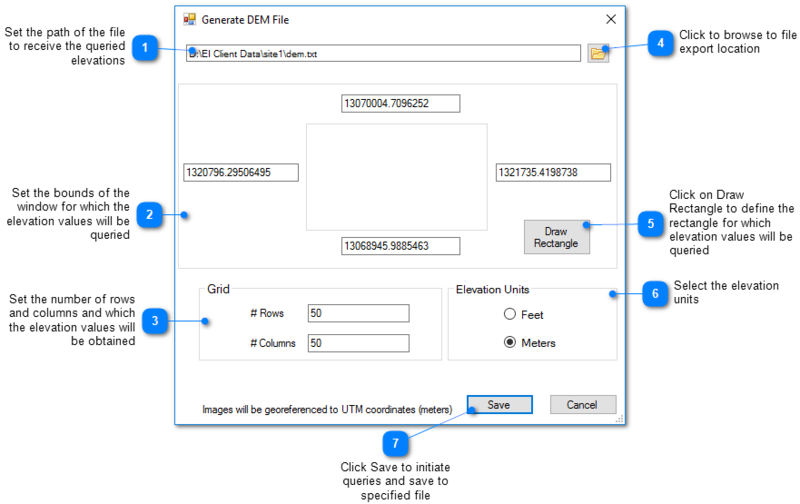 For those occasions, EnviroInsite has the ability to query online services from the USGS or Natural Resources Canada service and construct its own Digital Elevation Model (DEM) data file. Select Reports> USGS DEM File or Reports> Canada DEM File from the main menu to access these reports. Note: This process may take a long time to complete due to the exchange of data with the online services. After a short period of time (10 to 20 seconds), the estimated number of seconds remaining is displayed at the bottom of this window. View a training video on the Digital Elevation Model here.